Yellow and green together make a yellow-y green. Unless you're talking onions. 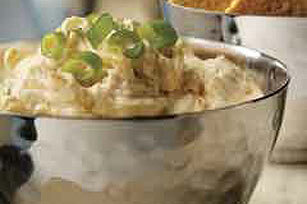 Then they can combine with dressing and cream cheese to make an awesome dip. Heat Italian dressing in large skillet on medium heat. Add yellow onions; cook 15 to 20 min. or until browned and caramelized, stirring occasionally. Stir in pepper. Cool. Mix cream cheese and MIRACLE WHIP in medium bowl until blended. Add caramelized onions and green onions; mix well. Dip can be made ahead of time. Refrigerate up to 24 hours before serving.